Just outside Silves Castle is a little cafe where we have stopped several times before. 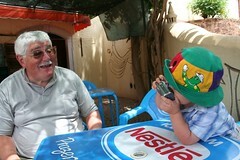 While waiting for refreshment, Joel thought he’d take a snap or two of Grandad… with Grandad’s camera. We haven’t found if he actually TOOK any yet, but the thought was there!